Trump stumbled defiantly through the rest of a shocking week: shifting his positions on backing U.S. intelligence, considering an offer to allow Russian intelligence to question the former U.S. ambassador to Russia, publicly criticizing the Federal Reserve, and threatening his former fixer Michael Cohen who had taped their conversations. Russian Maria Butina was arrested and indicted on charges of spying — the 26th Russian to be indicted but first Russian to face charges in U.S. court for interfering in the 2016 election. As Butina’s ties to the NRA surfaced, Treasury Secretary Mnuchin took steps to change existing rules and allow dark money donors to remain anonymous. Shockingly, as the week came to a close, Trump has still yet to admit it was Russia who interfered in the 2016 election. On Sunday, NYT reported British investigators believe the nerve agent attack against Sergei Skripal and his daughter was likely carried out by GRU, the same Russian military intelligence indicted in the Mueller probe. The Toledo Blade reported a woman spray-painted “Hail Trump” and the N-word on a neighbor’s home, just hours before Toledo’s annual African-American Parade. Patricia Edelen, 47, was arrested. The mayor of Wilmington, Delaware apologized after Muslim children from the the Darul Amaanah Academy summer camp were asked to leave a public pool because of their religious clothing. Cal Poly rescinded a scholarship for pro-Trump wrestler Bronson Harmon after video surfaced of him yelling an anti-gay slur and making an obscene gesture during a counter-protest to a Families Belong Together march. The Tennessean reported on a record number of Tennesseans using Confederate flag license plates: there were 3,273 active plates in June 2018, up 72% from June 2015. A HuffPost/YouGov survey found 85% of Trump voters believe MS-13, the gang Trump frequently conjures to defend his immigration policy, is a very serious or somewhat serious threat to the entire U.S.
On Sunday, Trump’s Health and Human Services Department submitted revised plans to reunite families, after Judge Dana Sabraw accused the regime using safety concerns as “cover” to avoid meeting his July 26 deadline. Judge Sabraw said the government “has an absolute 100 percent obligation to meet these deadlines and to do it safely.” The regime will use methods other than DNA testing to verify parentage for older children. On Sunday, WAPO reported that experts say migrant children being reunited with parents may be deeply traumatized. Some children suffer nightmares, others have trouble trusting their parents again. On Thursday, NBC News reported that as the court imposed July 26 deadline nears for the regime to reunify the 2,551 migrant children over 5 years old, in a court filing the regime said they have just unified just 364 so far. Of 1,607 parents eligible to be reunited, 719 have final orders of deportation, leaving them with the choice of bringing their child back to a violent country or leaving them behind in the care of the U.S. government. The judge temporarily halted the regime from deporting reunited migrant families, accepting the ACLU argument that many of who plan to seek asylum need time to file claims. On Monday, hours before his one-on-one summit with Putin, Trump sent two tweets calling the Mueller probe a “Rigged Witch Hunt” twice, and again blamed Obama for doing nothing. Trump also tweeted, “Our relationship with Russia has NEVER been worse thanks to many years of U.S. foolishness and stupidity,” and falsely claimed the probe was headed by Peter Strzok. On Monday, Germany’s foreign minister said Europe could no longer rely on the U.S. after Trump called the European Union a “foe,” urging Europeans to close ranks and readjust its partnership with the U.S.
Putin arrived late, and the summit at the Presidential Palace in Helsinki started about an hour after schedule. In a short public greeting, Trump declared he expected to have an “extraordinary relationship” with Putin. Trump and Putin started by speaking alone, with only interpreters, for two hours — longer than the 90 minutes allotted on Trump’s daily schedule. After, the two held a 46 minute news conference. 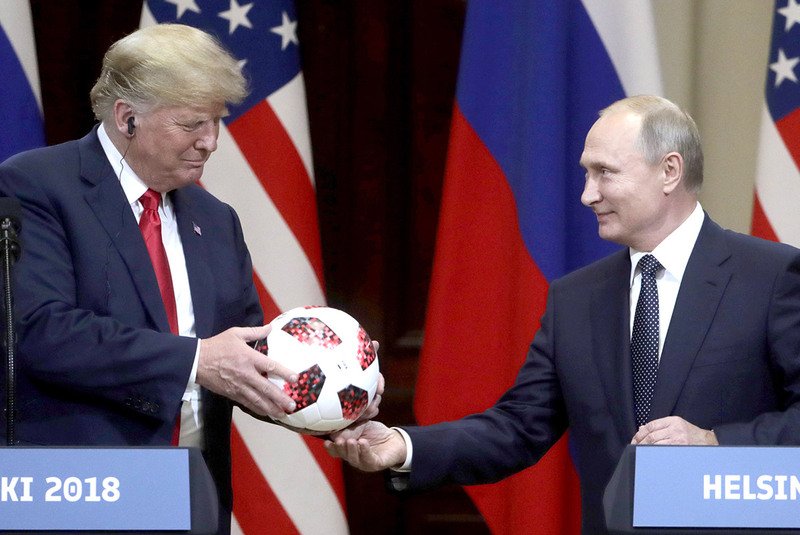 Trump declined an invitation by an AP reporter, with the world watching, to warn Putin not to interfere again, instead deferring to Putin who said, Russia “has never interfered and is not going to interfere” in U.S. elections. Putin suggested what Trump described as an “interesting idea” — Mueller’s investigators could come to Moscow and question the Russian suspects, so long as Russians could come to Washington D.C. to do the same. Former Defense Secretary Chuck Hagel said Trump “failed America today.” Former Director of National Intelligence James Clapper said Trump “essentially capitulated and seems intimidated” by Putin. On Monday, other Republicans reacted, but mainly in muted ways, defending the U.S. intelligence community and their assessment, but offering muted criticism of Trump and his behavior. Reuters reported Russian establishment viewed the summit as a win for Putin, noting the symbolism of a U.S. leader sitting down with Putin after four years of international isolation triggered by the annexation of Crimea. Russia state TV reported “Trump is ours,” and joked the U.S. lawmakers came to Russia “to make deals with our hackers” for midterms. They report Putin will run circles around “political neophyte” Trump. On Tuesday, Motherboard reported Election Systems and Software, the top voting machine maker, admitted in a letter to Sen. Ron Wyden that it installed remote-access software on election-management systems. The company says it provided remote connection software “to a small number of customers between 2000 and 2006,” contradicting earlier statements, and raising concern about the security of their systems. Reportedly, chief of staff John Kelly was irate about Trump’s comments at the summit, and called around to Republicans on Capitol Hill, giving them the go-ahead to speak out against Trump. On Tuesday, amid widespread criticism and condemnations, Trump tweeted, “While I had a great meeting with NATO…I had an even better meeting” with Putin, blaming “the Fake News” for misreporting. Secretary of State Mike Pompeo will testify before Bob Corker’s Senate Foreign Relations Committee on July 25. Although the hearing was scheduled on North Korea, he is expected to be grilled on Trump’s meeting with Putin. On Tuesday, Senate Majority Leader Mitch McConnell and GOP leaders used their weekly press conference to support U.S. intelligence findings on Russian interference, and to reassure Europe about America’s commitment to its allies. McConnell said the Senate might move forward with new sanctions against Russia in the wake of Trump’s remarks, mentioning the bipartisan bill from Sens. Marco Rubio and Chris Van Hollen, which would impose new penalties. Trump claimed as he read the written statement, “The sentence should have been, ‘I don’t see any reason why it wouldn’t be Russia.’ Sort of a double negative,” in explaining his shifting position. Trump then ad-libbed and contradicted himself, “Could be other people also. A lot of people out there,” and added, “There was no collusion at all.” This jibes with Trump’s unwillingness to call out Russia. A CBS poll found just 32% of Americans approve of Trump’s handling of the Helsinki summit, including 68% of Republicans. Seven in ten believe the U.S. intelligence assessments that Russia interfered in the elections. On Monday, the Justice Department disclosed that Maria Butina was arrested Sunday and appeared Monday in court. Butina is accused of trying to cultivate relationships with American politicians over a two-year period. Butina twice tried to set up secret meetings between Trump and Putin during the 2016 campaign. In June 2015, as Trump announced his campaign, Butina wrote a column in a conservative U.S. magazine, suggesting that only by electing a Republican could the U.S. and Russia hope to improve relations. According to charges, at the behest of Alexander Torshin, a Russian government official, Butina made connections through the National Rifle Association and religious organizations to steer the GOP towards pro-Russia positions. Butina is the 26th Russian to face charges in the Russia investigation, and the first to be arrested. Charges were filed by the DOJ, which already had an investigation underway, and worked parallel to the Mueller probe. In May 2016, Torshin and Butina proposed a meeting between Trump and Putin during the annual NRA convention in Kentucky. Kushner shot the idea down, and instead Donald Jr. met the two at the NRA dinner. The charges also say an American operative met with Butina in Moscow and helped identify political, news media, and business officials to target — the most explicit evidence yet of an American aiding Russian efforts. On Monday, Secretary Steven Mnuchin said the U.S. Treasury would no longer require certain tax-exempt organizations including politically active nonprofit groups, such as the NRA, to report dark money donors. Authorities said Butina used a student visa to attend American University, and through a pro-gun organization set up in Russia, got in contact with GOP operative Paul Erickson and other top NRA officials as early as 2013. Authorities also alleged Erickson had “involvement” in Butina’s efforts to establish a “back channel” line of communication between the Kremlin and the Republican Party through the NRA. On Tuesday, in a court filing, Mueller asked the judge to grant immunity from prosecution for five potential witnesses whose testimony Mueller may want to compel in the upcoming Paul Manafort trial. Mueller said the potential witnesses have not been identified publicly in connection with the case, and asked the judge to seal from public view the court motions detailing the witnesses’ identities. On Tuesday, CNN reported the MP leading a British investigation into online disinformation said data collected by Professor Aleksandr Kogan on behalf of Cambridge Analytica had been accessed from Russia and other countries. On Wednesday, CNN reported prosecutors from Mueller’s team met with attorneys representing Andrew Miller, a former Roger Stone associate, and spent almost 90 minutes in a sealed court proceeding before Chief Judge Beryl Howell. The meeting signals Stone is still under investigation by Mueller team. Howell oversees matters related to the federal grand jury that has indicted in Week 87, led to the indictments of 12 Russians. On Wednesday, Mueller’s team published nearly 500 pieces of evidence for the Manafort trial, which begins next week. Exhibits include Manafort’s homes, cars, a $21,000 watch, and high-end clothing. There will also be photographs of the putting green at his home in the Hamptons, as well as email communication between Manafort and Tad Devine, a Democratic consultant, who worked for Ukrainian President Yanukovych. On Monday, FCC Chairman Ajit Pai announced he has serious concerns about Sinclair Broadcast Group’s acquisition of Tribune Media, saying he would put the deal through a lengthy administrative process, likely dooming it. AP reported Trump will be the first sitting president to skip the All-Star Game in Washington D.C., citing his preference for friendly crowds. NYT reported Trump has yet to award the National Arts Medals, an award created by Congress in 1985 to recognize the country’s greatest artists, which typically goes to about a dozen artists each year. On Tuesday, the Scotsman reported U.S. government spending records show Trump’s Turnberry firm was paid £52,477 to cover the accommodation bill for his weekend stay at his resort. In an op-ed Beck Dorey-Stein, a White House stenographer from 2012 to 2017, a staffer position that stays through changing administrations, said Trump uniquely refused to be recorded and have a record of his words. On Wednesday, New York Gov. Andrew Cuomo opened the door to a possible criminal case against the Donald J. Trump Foundation, saying the state will provide a criminal referral if Attorney General Barbara Underwood asks for it. CNN reported on a 2016 panel in which Trump’s Supreme Court nominee Brett Kavanaugh, when asked what one decision should be overturned, said he would “put the nail” in the ruling which upholds independent counsels. On Wednesday, WAPO reported Trump loyalists at the Department of Veteran Affairs are taking aggressive steps to purge or reassign staff members disloyal to Trump ahead of Robert Wilkie’s likely confirmation. On Wednesday, the Senate confirmed Trump’s 23rd circuit court judge, breaking a record set by George H.W. Bush who got 22 confirmed. On Wednesday, anti-Trump protestors, joined by lawmakers, held a candlelight vigil in front of the White House to protest Trump’s refusal to denounce Russian interference, and to show support for Mueller. Protestors chanted, “Hell naw Kavanaugh,” and “Trump is not above the law!” According to organizers, similar protests took place in 200 cities around the country. On Wednesday, Politico reported the Interior Department’s internal watchdog opened a full investigation into a real estate deal involving a foundation established by Secretary Ryan Zinke and Halliburton Chairman David Lesar. Under the arrangement, Lesar would be building a parking lot to benefit a major redevelopment project that could raise the land value of Zinke’s nearby properties. Zinke has oversight over issues impacting Halliburton. On Thursday, the Trump regime’s Interior and Commerce departments announced a joint proposal which would strip the Endangered Species Act of key provisions, weakening a law enacted 45 years ago. If approved, protections for threatened plants and animals would be made on a case-by-case basis. The proposal would also strike the phrase “without reference to possible economic or other impacts” from the Act’s language. Conservationists decried much of the proposal, including the removal of a requirement compelling federal agencies to consult with scientists and wildlife agencies before approving permits for ventures such as drilling. Daily Beast reported Michael Barry, the senior National Security Council director for intelligence programs, is leaving the White House to rejoin the CIA, creating another in the growing list of vacancies in Bolton’s NSC. On Tuesday, in an interview with Fox News host Tucker Carlson, Trump said he’s bothered by Article 5 provisions of NATO that require the U.S. to come to the defense of other member countries. Russia has made clear they view the region as part of their sphere of influence, and said the country would “regret” joining NATO in 2017. Article 5 has only been invoked once, after the U.S. was attacked on 9-11. On Wednesday, when asked by a reporter whether Russia is still interfering in U.S. elections, Trump answered, “no,” contradicting Coats, and his declaration Tuesday that he believes U.S. intelligence on Russia. On Wednesday, press secretary Sanders held a White House daily briefing for the first time in over two weeks. Sanders refused to rule out the Kremlin’s request to question Americans, saying Trump is open to the idea of having former U.S. ambassador to Moscow Michael McFaul questioned by Russia, and Trump is “going to meet with his team” to discuss the offer. That Trump was considering turning over Americans drew astonishment and outrage from current and former U.S. officials. The proposition is unheard of. McFaul served as U.S. ambassador to Russia from 2012–2014. On Thursday, the Senate planned a resolution introduced by Democrats to block Trump from allowing Americans, such as McFaul, from being questioned by Russian intelligence. The Senate’s resolution passed 98-0. WAPO reported Trump did not understand the massive diplomatic and security implications of turning Americans over to an autocratic regime that jails and kills dissidents. On Thursday, WAPO reported as Russian officials describe “important verbal agreements” in Helsinki, at the most senior levels across the U.S. military, officials are scrambling to determine what Trump agreed to. Press officers at the Pentagon are unable to answer media questions. As Moscow suggests a new arrangement regarding Syria, the U.S. General in the region was scheduled to brief media and did not yet know details. Defense Secretary Jim Mattis did not attend Trump’s Cabinet meeting on Wednesday, and has not appeared in public this week, or been available for comment. On Thursday, Trump-ally Devin Nunes blocked Rep. Schiff’s motion to subpoena the interpreter at Trump’s Helsinki summit with Putin to testify in closed session before the House Intelligence committee. Trump also tweeted, “The Democrats have a death wish, in more ways than one,” saying Democrats want to abolish ICE. On Thursday, Putin warned there are certain political “forces” in the U.S. — a reference to what he views as an anti-Russian cabal within U.S. national security — trying to undermine his successful summit with Trump. Putin again invoked this deep state notion, saying consider the efforts of a “quite powerful” group in Washington that seeks to undermine good relations between the U.S. and Russia. Sander’s tweet was sent hours after Trump had tweeted that he was looking forward to “our second meeting” with Putin, and defended his Helsinki summit performance. On Thursday, in an interview at the Aspen Security Forum, DNI Coats told NBC’s Andrea Mitchell that he still does not know what happened in Trump’s one-on-one meeting with Putin. Coats said he felt the need to “correct the record” when he issued a statement Monday reaffirming that the U.S. intelligence community has concluded that Russia interfered, after Trump’s statement at the summit. Coats also said he was not made aware of until it was made public that Sergey Kislyak and Lavrov met with Trump in the Oval office in May 2017. Coats noted with a long sigh that it was probably not the best thing to do. Earlier at the Aspen Security Forum, Tom Burt, Microsoft’s vice president for customer security and trust, said the same Russians who hacked the DNC have targeted at least three 2018 Congressional campaigns. Burt declined to name the candidates or their party, citing privacy concerns, but said they are notable candidates running for reelection. Trump’s DHS has said they’ve seen no sustained campaign against election systems. Also at Aspen, deputy attorney general Rod Rosenstein said the DOJ will inform American companies, private organizations, and individuals if they are being covertly attacked in order to affect elections or the political process. Rosenstein said focusing on a single election misses the point, adding Russian threats are “pervasive,” and “meant to undermine America’s democracy on a daily basis,” whether it is election time or not. On Thursday, Republicans in the House voted down a Democratic effort to increase election security spending. Politico reported based on a survey of all 50 states, most states’ election offices have failed to fix their most glaring security weaknesses, and few have plans for how to use their share of election security funding. On Friday, NYT reported Michael Cohen secretly taped a conversation with Trump two months before the election discussing payments to Karen McDougal, who said she had an affair with Trump. The FBI seized the recording in their raid. Rudy Giuliani told the Times that Trump had discussed payments to McDougal with Cohen in person on the recording, and said Trump did not know in advance about the payment American Media Inc. made to silence McDougal. CNN reported Cohen had other recordings of Trump in his records that were seized by the FBI. Giuliani dismissed the other recording as mundane. A source told CNN that is not true. On Friday, Reuters reported Mnuchin is open to lifting sanctions from Russian aluminum giant Rusal, owned by oligarch Oleg Deripaska. Mueller is investigating financial ties between Deripaska and Manafort. On Friday, Republicans agreed to water down legislation in reconciling bills designed to punish Chinese telecom company ZTE, delivering a victory to Trump. The Senate version would had restored a full ban. On Friday, Trump also tweeted “The NFL National Anthem Debate is alive and well again — can’t believe it.” On Thursday, the NFL halted enforcement of anthem rules while working out a solution with players. On Saturday, WSJ reported at the end of a turbulent week, Trump is taking an increasingly defiant approach, tired of being told he can’t do things like criticize the Fed or the intelligence community. Trump’s comments on the Fed ricocheted through currency and bond markets, leaving the White House to clarify his comments and say Trump respects the Fed’s independence. Reportedly before the summit, Trump had authorized the Justice Department to release the indictments against 12 Russians, agreeing it would strengthen his hand with Putin in bringing up election interference. Trump’s plan, formulated with his aides, was for him to “shove it in Putin’s face and look strong doing it.” Trump did the exact opposite, siding with Putin and saying he saw no reason why Russia would have interfered. Russian associated social media accounts urged the U.S. to free Butina. On Thursday, the Russian Foreign Ministry posted a call to action on its Twitter account to mobilize a digital “flash mob,” including changing profile photos. On Saturday, TASS reported Russian Foreign Minister Lavrov told Secretary of State Pompeo that U.S. actions against Russian citizen Butina were inadmissible, and said she should be released as soon as possible.